Wright Square in our succulent city of Savannah is one of the four original squares. It dates back to 1733, the year of Geogia's founding. At that time it was where the colonial criminal justice system was located. There was a roughly built courthouse, a primitive jail, a gallows, whipping post and a set of stocks. The square was an expanse of raw earth partially covered in sand, with a few lonely trees. Not the lovely Wright square that we have today. The ghost in this square is that of Alice Riley. She was a red haired young Irish woman, an indentured servant. She had been assigned to a dissolute and frequently sickly man named Wise. Wise was said to be a cruel master to young Alice. Accusations of beatings, verbal and sexual abuse swirled about him. After only three months, Alice Riley had decided she'd put up with it long enough. She and another indentured servant, a man named Richard White killed Mr. Wise and were captured and brought to Wright Square for punishment. Richard met his death on the gallows but Alice had to wait seven months because she was pregnant for her turn. Alice was the first woman in the colony of Georgia to be convicted of murder. She was the fourth in America. 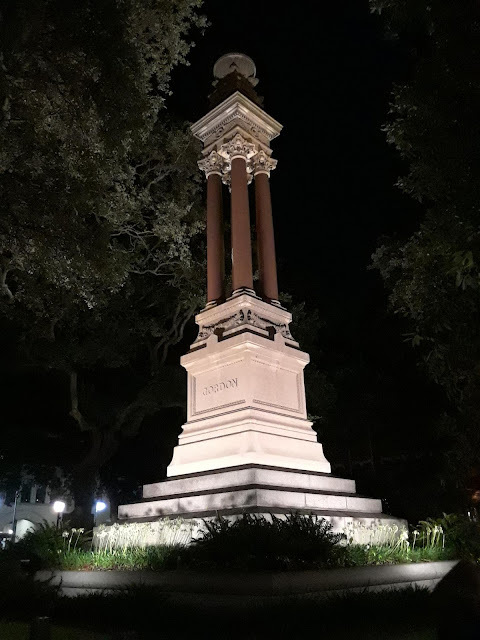 Details about Alice Riley's time in Savannah abound, some of them contradictory but what all agree on is that she still haunts Wright Square today. She is said to appear in a filthy and torn white dress, with tangled and disheveled red hair. Often the ghost of Alice looks so realistic that people mistake her for a living person. That, my friends, is a strong haunting. Learn more about Alice Riley on Mad Cat Tour's Ghosts of Savannah Tour.